Find here Complete List of Gree Mini Split Air Conditioner Troubleshooting and Error Codes. Whenever there is an Issue, The display of Gree Air Conditioner will show Error Code. This means that there is a problem with the Gree Mini Split AC unit. The Gree Mini Split Air Conditioner Error Code tells you what is the problem and which part is responsible for it and what you need to do for Gree Mini Split Air Conditioner Troubleshooting. Please see the below listed Gree Mini Split AC Error Codes and resolve your issue based on it. The Gree AC Vireo System is very advanced and has a diagnostics system with error codes. It outdoor unit main function is to display the status indicators and the indoor wall unit main function and function of remote control is to show the error codes. 2) Blocked or dirty outdoor coil . 2) Indoorcoil temperature sensor no calibrated. 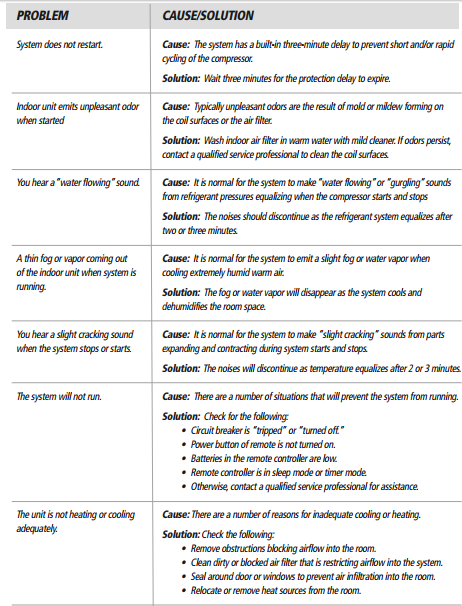 temperature, overload) in service manual. 1) No jumpercap inserted on the control board. 2) Incorrect or damaged jumpercap on control board. 1) Loose or bad connection between sensor and control board. 2) Indoor ambient temperature sensor damaged. 2) Indoorcoil temperature sensor damaged. 2) Outdoor ambient temperature sensor damaged. 2) Outdoor coil temperature sensor damaged. 2) Discharge temperature sensor damaged. 1) Supply voltage on L1 and N is above 265Vac. 2) Capacitor on control board malfunction. 3) Outdoor control board malfunction. 1) Supply voltage on L1 and N is below 150Vac. 1) Lack of thermal grease on IPM module. 2) Heat sink (radiator) not tightly mounted. 1)Wiring terminal OVC-COMP is loose. 2) Refer to the malfunction analysis in Service Manual. 1) IPM module over heating. 2) Improper or Low voltage at the IPM module. 2) Fan motor or blower wheel bearings malfunction. 1) Compressor voltage is not balance. 1) Mis-wiring of the reactor filter and PFC capacitor. 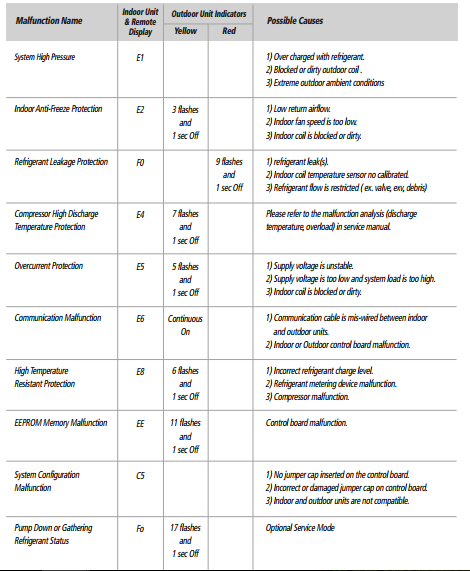 2) Reactor filter or PFC capacitor malfunction. Indoor and outdoor units are not compatible. 1)Voltage to reversing valve is less than 175V. 2) Loose connections between reversing valve and control board. 3) Reversing valve solenoid malfunction. We hope that with help of Gree Mini Split Air Conditioner Troubleshooting and Error Codes, you will be able to resolve issues. Please keep visiting our site for more AC troubleshooting. Do comment for any issues or questions and we will be happy to answer. How do you clear a code from the history? The gree inverter unit,l.m working now,it shown E7,but the error code is not part of possibly error in the manual.please kindly assist me,to know the cause.